We love Cars Toon: Mater’s Tall Tales for the Wii! We are a Wii family. We play the games when we are bored, sick, or need to pass the time while waiting for the weather to clear up. Some of the games we own cause turmoil in the family (i.e., only one kid can play at a time and he "hogs" it for too long). 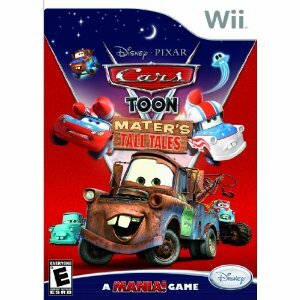 The new Cars Toon: Mater’s Tall Tales game for the Wii was refreshing, in that it had over 30 mini games that everyone could play, and more than one kid could play at a time! This game has hours of play due the variation in the games. You can get competitive, or just play for fun. Earning trophies and points is a goal for my 7-year-old, but not for my 4-year-old, so we love that this game accomodates each of them without making anyone feel like a loser. To read more about this fun game, see the official website! *I wrote this review while participating in a blog tour campaign by Mom Central Consulting on behalf of Disney Interactive Studios and received the Cars Toon: Mater's Tall Tales Wii game to facilitate my review.